Sydney's trivia round goes south. 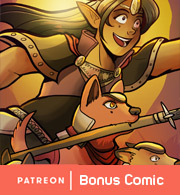 This week's bonus vote comic is a question from Scia! : How do the characters like their Wingbucks products? True Magic is a hilarious comic about a team of commoners who want to turn the tables on the uppity magical nobles who try and use them for target practice. 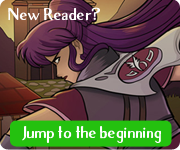 They travel to the big city, but infiltrating noble society wasn't quite what they expected. (For one thing: gladiatorial combat arenas?) Do give it a read, it's one of my favorite new comics! Ball and Chain is the story of an escaped mutant and a sticky-fingered (or amorphous goo-fingered) pickpocket in alternate reality Canada who stumble into the care of The Agency: a home for mutants with all kinds of abilities. Several f-bombs and head-explodyness, but a fun ride.